Let’s face it, flashes can be intimidating and confusing for photographers who haven’t mastered using them. Well, Canon’s newest Speedlite, the 470EX-AI, was designed to take all the guess work out of it by using artificial intelligence to do the leg work for you. The 470EX-AI features three different modes, completely manual, semi-automatic and fully automatic. This is when the magic really happens. 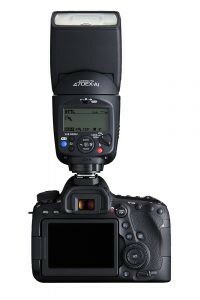 Setting the 470EX-AI Auto Intelligent Bounce function to full-auto mode allows the flash head to calculate the best angle to aim the head for optimal results. 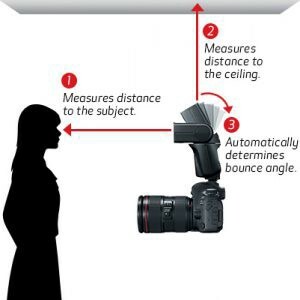 It does this by measuring the room (walls and/or ceiling) that you are shooting in, and distance to your subject. It then calculates the optimum angle for the flash head and using built-in servos, moves the head to that angle. The nice thing about this is that it works in either portrait or landscape orientation and will keep the head angled in the correct direction even when switching back and forth on the fly. When using the semi-automatic mode, you can pick whatever angle you want to point the flash and then lock it in by pressing the angle set button on the side of the flash. Again, once locked in, the flash head will automatically rotate to that angle with a double tap of the shutter button regardless of the orientation of the camera. Of course if you prefer to shoot fully manually (but let’s be honest, you probably aren’t going to be buying this flash if you do), the 470EX-AI acts just about the same as any other Canon Speedlight in this price range. The 470EX-AI includes infrared AF assist (even during bounce shooting) and broad flash coverage from 24–105mm and even up to 14mm with the Wide Panel cover in place. While the 470EX-AI doesn’t offer radio triggering, when used with a compatible flash or a Speedlite Transmitter mounted on camera, it can serve as a receiver unit in an optical wireless multi-flash set-up at distances of up to 49.2 ft./15m (indoors). Not sure if this is something that Canon can address through a future firm-ware update or not, but let’s hope they can come up with a fix for everyone with a pre-2014 Canon camera.